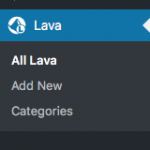 The Lava menu is available in your WordPress Dashboard sidebar. From there, you can save and organize any number of Lava templates. The Lava editor is where you can enter your Lava markup. The editor will highlight, auto-complete, and auto-indent your code as you type. You can specify how long Lava output will stay cached before requesting updated output from Rock RMS.